I’m just as bummed as you are that this Macworld Expo will be Apple’s last (and that last year’s Expo was apparently Steve Job’s last), but I am a little shocked by the Mac community’s reaction to what was ultimately a business decision. Sure, I like my Mac, iPod, and iPhone just as much as the next Apple blogger, but I have never been under any illusion that I am anything more than a pile of disposable income to Apple. Steve Jobs and the rest of Apple’s employees have one boss—Apple shareholders—and they are committed to one thing—making those shareholders money. Granted, a great way to make money is by creating products that inspire emotional ties (which help sell even more product), but it's foolish to believe that Apple has ever been as touchy-feely as some people think. Tonya Engst wrote a great piece titled ‘A Mother’s Letter to Apple about Macworld Expo.’ It's well-written and fun to read, but ultimately misguided. Thinking of any multinational corporation as a person is a path strewn with peril. To many people, Steve Jobs is Apple, and while he's a very powerful driving force at the company, Apple, Inc. is a faceless corporation that is run by people wearing suits, not turtlenecks and jeans (oh, the horror!). And what do those people in business suits want to do? Make money. Those people, including Jobs, have decided that Apple doesn’t need the huge expense of Macworld Expo to grab headlines for product introductions any more, and I tend to agree. I always found it odd that every year I flew across the country to see a man introduce a bunch of objects, and that I should then push and shove my way through a crowd (in another building) to touch those objects, but that I couldn’t buy them. What’s the point in that? I know, I know. Macs are cool. iPods are the funnest things ever. iPhones feel like artifacts from the future. All these things are true, and that’s why Apple is raking in the cash and Apple Stores are popping up all over the place. 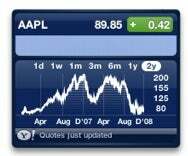 Make something great, market the heck out of it, and count your money—that's the winning formula that Apple has been following these days. The truth is, much as you might want it to, Apple doesn’t care if you have a multicolor logo tattooed to your arm. Or if you named your first child ‘Moof.’ Nor will it care if you remain silent during Phil Schiller’s keynote at Macworld Expo 2009. (Though really, aren’t we all adults here? The man will be under enough pressure demoing stuff in front of thousands of people—that on its own deserves some applause from the crowd. Plus, Phil has always struck me as the kinda guy who wears Old Spice and can tell you a story or two over a domestic beer. Give ‘im a break!). What Apple cares about is whether or not you’ll be buying whatever gewgaw or iBauble it releases next (all designed, of course, to make you immediately dissatisfied with whatever Apple equipment you currently own). Let's face it: the people crying foul the loudest about Apple’s Macworld Expo plans are also the kind of people that will buy whatever Apple comes out, with nary a moment’s hesitation. The harsh reality is that Apple isn’t your friend—and even if it were, it'd probably be the flaky guy who never returns your phone calls.